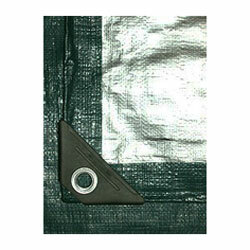 PRODUCT: 100' X 100' HEAVY DUTY, 12X12 WEAVE, UV-GRADE, GREEN AND SILVER TARP. PRICE/EACH. (Heavy - Truck Shipment Only, use Freightquote). SILVER FINISH ON ONE SIDE GREEN ON THE OTHER SIDE. STRONG 12 X 12 WEAVE HDPE WOVEN CENTER. UV RESISTANT LDPE LAMINATION BOTH SIDES. APPLICATIONS: Designed for all types of UV and sun exposure or heavy duty areas including house tarp, boat tarp, truck tarp, hay tarp, field tarp, trailer tarp, storage cover, roof tarp, field cover, infield cover, infield tarp, field tarp, gym floor cover, camping tarp, boating tarp. CONSTRUCTION: Silver on one side, Green on the other, 5.0 oz. per sq. yard, ultra-violet resistant treated reinforcing yarns, black woven scrim, heat-sealed seams for total water-proofed tarp, reinforced hems and rust proof grommets. OPTIONS: Other sizes from 6x8 to 100x100. 1/4 inch x 600 Foot 3-Strand Twisted Monofilament Yellow Polypropylene Rope, UV Stabilised, 1250 lb. Break Strength. Price/Each.